Recent weeks have seen increasingly concerned calls, from within and without Japan, for the Japanese government to take a direct role in managing the multifaceted crisis at the Fukushima No. 1 nuclear power plant. The most recent opinion poll shows 91 percent of the Japanese public wants the government to intervene. The Economist calls Fukushima a “nightmare,” and the editors of Bloomberg deem it “ground zero” for the Abe government. Tepco’s handling of the stricken plant continues to be a litany of negligence and error, raising grave doubts over whether the company is up to the incredibly difficult and important task of decommissioning the plant. While it may be politically inconvenient for Prime Minister Shinzo Abe to accept, it is time to intervene and take over the plant before it is too late. Understandably, most commentary on the Fukushima plant focuses on the multiple leaks of water laced with high- and low-level radiation. An estimated 300 tons of highly toxic water, including Strontium-90, has leaked from a hastily constructed tank. This became a level-3 crisis on Aug. 21, “serious” on the United Nation’s 7-point International Nuclear and Radiological Event Scale, and represents the most urgent reported problem at the plant since the initial meltdowns. Yet Japan has been very lucky that nothing worse has occurred at the plant. But luck eventually runs out. The longer Tepco stays in charge of the decommissioning process, the worse the odds become. Without downplaying the seriousness of leaks and the other setbacks at the plant, it is important to recognize that things could very quickly get much worse. In November, Tepco plans to begin the delicate operation of removing spent fuel from Reactor No. 4. There are 1,300 used fuel rod assemblies in a pool above the reactor. They weigh a total of 400 tons, and contain radiation equivalent to 14,000 times the amount released by the Hiroshima atomic bomb. The spent-fuel pool, standing 18 meters above ground, was damaged by the earthquake and tsunami and is in a deteriorating condition. It remains vulnerable to any further shocks, and is also at risk from ground liquefaction. 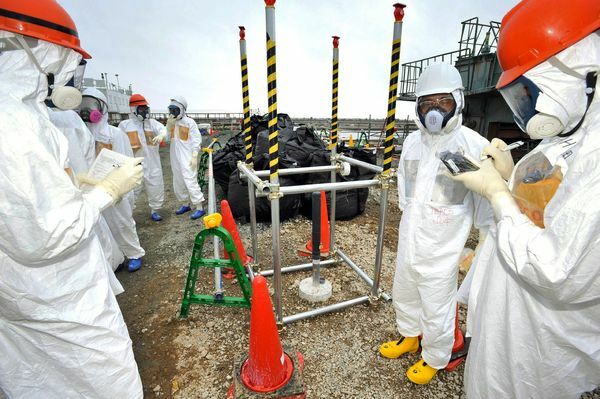 Removing its spent fuel, which contains deadly plutonium, is an urgent task. Even under ordinary circumstances spent-fuel removal is a difficult task, normally requiring the aid of computers. But due to the damage, removal of spent fuel from Reactor No. 4 and the five other reactors will have to be done manually. This work will be undertaken in arduous conditions, increasing the risk of yet another mishap. And if something does go wrong, the consequences could be far more severe than any nuclear accident the world has ever seen. If a fuel rod is dropped, breaks or becomes entangled while being removed, possible worst case scenarios include a big explosion, a meltdown in the pool, or a large fire. Any of these situations could lead to massive releases of deadly radionuclides into the atmosphere, putting much of Japan — including Tokyo and Yokohama — and even neighboring countries at serious risk. When the stakes are this high, who do you want to bet on? Tepco’s abysmal track record is characterized by repeated blunders. Even now there are few signs that Tepco fully understands the magnitude of the situation they — and we — collectively face. It is therefore vital, literally a matter of national security, that Fukushima No. 1′s decommissioning be taken over by the government with the assistance of an international task force of experts. Regarding the contaminated water problem, industry minister Toshimitsu Motegi announced on Monday that, “from now on, the government will move to the forefront.” This is a start, but not enough. Tepco must be relieved of control of the whole decommissioning process. One of the key findings of the independent commissions that studied the accident at Fukushima No. 1 was that it was a “manmade disaster” because the risks and warning signs were repeatedly down-played or ignored. These kinds of warnings have been streaming from the plant since the crisis began. How many more alarm bells does Abe need before he recognizes the gravity of the problem and intervenes? It is understandable why Abe and his backers do not want to directly take on this toxic job. They risk being tarred with responsibility for further mishaps. But this crisis is too big for Tepco, and the public wants decisive intervention. So the buck stops at the prime minister’s desk. Moreover, many of Abe’s key aims as leader — including restoring Japan’s economy and national pride — are dependent on successfully managing the precarious situation at Fukushima No. 1. Even his pro-nuclear agenda is reliant upon what happens there: With each new problem or revelation, public skepticism towards nuclear power deepens. Ultimately this is what Abe’s prime ministership will be judged on, whether he likes it or not. Now is the time for action, before it is too late. Andrew DeWit is a professor in the School of Policy Studies, Rikkyo University. Dr. Christopher Hobson is a research fellow at the Institute for Sustainability and Peace, United Nations University, Tokyo. Posted on October 12, 2013, in Earth Rights, Nuclear Energy and tagged 1, 300 used fuel rod assemblies, Andrew Dewitt, Bloomberg, crisis, decommissioning, Dr. Christopher Hobson, earthquake, fukishima, Fukushima, Fukushima Daiichi nuclear disaster, ground liquefication, ground zero, Hiroshima, Institute for Sustainability and Peace, Japan, japanese, meltdowns, national security, NRA Chairman Shunichi Tanaka, Nuclear and Radiological Event Scale, nuclear power plant, plutonium, Prime Minister Shinzo Abe, public skepticism, radionuclides, Rikko University, School of Policy Studies, spent fuel, TEPCO, The Economist, Tokyo, Tokyo Electric Power Company, Toshimitsu Motegi, toxic water, tsunami, United Nations University, water leaks, Yokohama. Bookmark the permalink. Leave a comment.